In this series on the management of skill acquisition, the ways in which skills are acquired was discussed in the first part, and the mathematical modeling of skill acquisition and atrophy was discussed in the second. But no modeling can capture all the complexity and nuance of the real world, especially in the ways the members of a team acquire skills. There are always exceptions to rules, and consequences that follow from them. In this third part of the series, some of the important exceptions and their consequences will be discussed. Each will have an impact on the math that was previously derived; how the derivations and the rules of thumb that guide skill acquisition are affected is this part’s focus. Although the importance of skill acquisition has been touted throughout this series, no judgement has been made on the seeking of a uniformity of skill proficiency across all members of a team. Experience indicates that it’s not generally best to build too much homogeneity into a team: skill differentiation brings different ideas and approaches to solving problems and building solutions. What needs to be found is the right mix. This occurs when each member of a team plays to the level of a virtuoso in their particular part. It is the mixture of all the individual members, all at the top of their game, working on all the different parts of a project together most effectively, that produces the best that can be made. A smart manager will know what skills should be acquired by individual members, according to their potentials, to best benefit the team. It is the right mix of the skills of all members coming together throughout a project at the appropriate time that must be managed. It’s a very hard thing to do well. On long-lived teams there will likely be members that have spent many years working to achieve advanced levels in certain skills. Some may have built their careers on the specialization of these skills, narrowing them over time rather than acquiring a broader skill set. Unless these members are missing fundamental skills everyone must have proficiency in, forcing these members to acquire less than requisite skills is probably not best for the team. A smart manager will recognize and respect this difference. There are other members that may be at or approaching extremes. Some of these specially-skilled members may resist the acquisition of skills that they feel are not in line with their career goals. Their intention is to increase their specialization, possibly at the expense of a broader perspective of project work through the atrophy of non-specialized skills. This may limit their utility to the team, becoming idled when work does not fit their expertise. Or there may be team members that are experts but want to acquire all of the skills needed by the team. Their intention is to broaden their capability on project work, possibly at the expense of specialization through the atrophy of specialized skills. This may limit their utility to the team, the effectiveness of their specialization being reduced when it is called for. 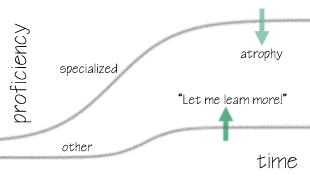 Specialization causes a sort of split-personality in skill acquisition by these members. The level of proficiency they are trying or trying not to achieve in non-specialized skills must be managed so that the correct skill levels can be maintained without compromising any high level of specialization that the project needs. Reduced or increased acquisition of skills must be balanced to make sure special expertise is appropriately available. should be minimized. The ⊖ operator is used to indicate that super-proficiency should not necessarily be penalized; if a member’s proficiency in a specialized skill is higher than what is needed, this may not necessarily have a negative effect on the team. The team members who have yet to specialize (or do not desire to) should be the ones who level up their non-specialized skills to become the strong, solid foundation of the team. While they can learn from each other, they can also learn from the specialists - though not to their level of proficiency, which could take many years. The everyday work will get done by these non-specialists; they will be the ones that keep everything running smoothly. 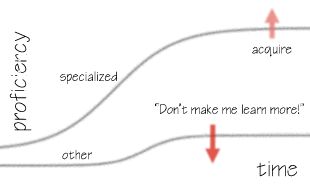 Specialization concerns all depend on what the team is doing. If no specialized skills are needed, the experts may be better off on another team, or on some ancillary team. In this case the original math still applies, but is much easier to optimize. For team members on a short schedule to specialization, the mainstream needs of the team may not be a fit. A specialist with aspirations that put them outside of the team’s project work must realize that they may be more of a hinderance than a help. Each individual’s skills must be evaluated according to the needs of the team, and a smart manager will take advantage of their growing expertise when possible. But if the opportunity is currently missing and the need is not anticipated, the specialist probably should not have a position on the team. It’s a cut-throat world out there, and team members will come and go. When time and effort has raised a team member’s skills, they naturally become more valuable - and marketable. Members whose strong proficiencies are underused - or not used at all - may take a look around for other opportunities. Despite the efforts to keep the team’s work interesting, maintain a stimulating environment, and provide good pay and benefits, it’s still not enough. Ambitious people can’t be kept happy forever doing the same thing every day. Anyone who has friends or is part of an outside-of-work network (and that’s everybody) will be approached by other’s who are hungry for their skills. Someday, sooner or later, a team member will walk out the door. When this happens, the team may be dramatically affected, feeling saddened because someone meaningful is now missing. For small teams, the feeling of loss may be devastating, akin to having a phantom limb and trying to reach for something. The lost team member that could make certain things happen is no longer there. In larger companies a team may still feel the loss, but there is less sensitivity to the change. Most big companies expect to lose people at any time. Even being on a great team may not be enough to make a member stay. Seeing someone leave is difficult and can cause the remaining members to lose the enthusiasm and passion about performing their assignments and being on the team. It’s also important that work performed is actually used by the business. When a team puts their effort into something but it is discarded, the result can be quite disconcerting. Members that meet a challenge set before them and see the result ignored will feel that what they do is unimportant. A sense of insignificance may begin to build up. If leaving for greener pastures is the only way to find meaningful work again, that person will be lost. In a finely-tuned team, everyone is working happily with each other, learning, acquiring skills, and getting done what needs to be done. But even then, there must be some slack in the schedule. Losing a skilled member shouldn’t cripple the team because of too-tight deadlines. The remaining members will need to pull together and pick up the work, but they should not be expected to just give up personal time to do it - and if they are asked then they must be given commensurate compensation. When a member leaves, the remaining members shouldn’t be forced to give up personal time to pick up their work until a replacement is brought in and trained. As long as the position is backfilled relatively quickly, work life will get back to a happy equilibrium without harm. If there’s too much stress then throughput will drop and work will slow down. If the lost work is mission-critical, the entire organization could suffer. When possible, a team should also have some choice. Team members should be given the opportunity to grow in their preferred directions. The team together should be able to direct the choice of skills whenever choice is appropriate. This trust by management is an important way to keep a team loyal. In tough situations, such as times getting tight for a business, a lost team member might not be backfilled at all. This is a very risky tack for a company, despite understandable necessity. The work will have to be done by the other members remaining on the team who may find themselves much busier and more stressed. If the load gets too heavy, they may start ‘looking around’ for something better. This could quickly escalate into a team that fails by hemorrhaging its members. A smart manager will hedge against these situations as well as possible, fighting to return the lost equilibrium by bringing in new people whenever members leave, and help them acquire the skills needed to perform and deliver. The team won’t be the same, but it will still function, and once new members are sufficiently skilled, should perform as smoothly as it did before. The team members and their work must be valued by management, and a smart manager will endeavor to strongly represent the team and their accomplishments to the business, making sure the team’s efforts are not wasted. The members must always understand how highly valued their proficiency is to the team, and management must reinforce this through recognition. When this is done, attrition may become a less significant problem. is large, the member may feel like a misfit. Sometimes this is temporary, such as when a new team member is coming up to speed. But it will sometimes be an indicator that unless circumstances change, that person will start looking for something more fulfilling. Mismatched proficiencies may be a signal that the team is capable of doing new things, or perhaps that the way the team performs its work needs to be adjusted. Required activities cannot just be dismissed - but they may need to be looked at from a different perspective, perhaps by stepping back and seeing them as something that is just a part of a bigger something else. Approaching work differently may mean the acquisition of different skills, and letting go of old ways. As the skills of a team change, new opportunities may look more approachable and the forward-thinkers will start to salivate. A smart manager will listen closely to the team’s thoughts of traveling in different directions and reaching new destinations. It is the team, together, that needs to evaluate if greater things can be taken on, but as far as the decision goes of whether to do them or not, that belongs to the business. But the business should not be short-sighted; it should foster and reward achievement in new areas. The fear of change in a businessperson’s heart has spawned the start of new ventures by those whose dreams of greatness were not allowed to be fulfilled. It is the dreamers on teams that were told “no” by the businesspeople that left and succeeded in new ventures while the businesses they left behind lost opportunities. Often the changes in an industry force a team to change how it gets things done. New skills may need to be acquired for new ways of doing things that seemingly appeared out of nowhere. New products can quickly come charging over the horizon that must be learned and used. The way something was done this morning may not be the way it should be done this afternoon, and must be done this evening - things can move pretty quickly these days. If the team is fortunate enough to have time to absorb changes, and possibly have some knowledgeable members to lead the rest forward and help everyone train up, it can enjoy the power of what’s new. However, if the team is already in over its head, new things can overload everyone and create chaos. A smart manager will keep his team highly skilled and looking forward. Each member has a different skill acquisition rate for each method, and they are also somewhat dependent on the skill being acquired. When the team must learn quickly as a group, it may be best to choose several acquisition methods and divide them across the team according to the proclivities of each member. When a job must be done expediently, work is sometimes deferred to get things out the door. “It’ll be returned to later when there’s more time.” This thing is, there never turns out to be more time, and like a hoarder’s house it piles up and makes it hard to get around. Eventually, a radical purging is needed and some Feng Shui applied to get the house back in order. The buildup of cruft is known as Technical Debt and the cleanup is paying for it. Unless this cleanup work becomes a priority, either because its status changes to urgent or it begins to encroach significantly on productivity, it may sit indefinitely. Contrary to popular opinion, technical debt is not necessarily bad - there really are things that will go away if you ignore them. Consider an average-sized task that is put aside in order to finish one with a higher priority. Several weeks, months, and even years might go by while this task sits gathering dust. Finally, a team member looks at the technical debt backlog and finds it. Surprise! The new way the team does things completely obviates the old task. It’s no longer technical debt so just forget about it. This is the happy solution though, not the usual one. When the team member looks at mosts tasks in the technical debt backlog, they are still viable and need to be done. If a task was added to the backlog relatively recently, it may be easy to pick up and complete. A few hours of work and what the team was too busy to do a month ago is now finished, clean and working fine. If the task is a bit older, it may require some rework and include talking to the team members who put it aside, discussing why they backlogged it. Some things may have changed in the interim, but often the changes are straightforward and a day or two later it’s in place and working. But consider an aged task, say one that’s three years old. It was parked in the back lot because it was hard and painful to take care of then. Now unfortunately, it’s still hard and painful - and what’s more the team members who started it left last year. Plus it needs to be done in a way that is practically a lost art to the team. New skills which were once old need to be re-acquired to do the work. A smart manager will look at the team and determine which members have the closest proficiencies to the appropriate required skills and team them up to acquire the remainder to get the job done. When the task requires disparate skills, it may be easier to handle if it’s broken into subtasks that are assigned to different team members. It’s a good policy to assign crappy old work that is unwanted by all but still must get done and spread it out over as much of the team as possible. Care should be taken to spread the painful tasks out and not just given them to the same members each time. Sharing the pain will keep everyone believing in mutual respect, fairness and decency. From the skill acquisition perspective, this often amounts to acquiring temporarily required skills Sr that will no longer be used once the task is completed. If the skills are like other skills already known by some team members Mr, they should be considered first to do the work, though the principle of shared misery should be respected. where σs is the proficiency of a skill similar to s. Selected team members should leverage their most effective method of gaining proficiency, but just acquiring enough to do the work. With any luck the temporarily required skills will be easily acquired and either atrophy quickly or have continued usefulness. A smart manager will realize that when only taking on technical debt instead of blazing new trails, the team may become disheartened quickly and morale may be temporarily reduced, increasing the risk of losing team members. The reduction of technical debt by finishing deferred tasks must be carefully meted out to avoid as much frustration and negativity as possible. In today’s modern-a-go-go workplace, a team member may sometimes be put into a position in which more than one manager must be served and a set of multiple priorities and very different skills may be required. There are many aspects to any set of problems, and different parts of an organization may have very different responsibilities, which require a very delicate balance of prioritization. Conflicting priorities imply that there may be conflicting demands on skill acquisition, leading to confusion and frustration. Years ago, the answer to handling this situation became a strategy called matrix management. Each manager created their own acceptance criteria and priority for the work in line with their own organizational concerns, but had to work together with the other managers of their matrixed members to determine global priority. This was a super idea, at least in theory. Unfortunately, it was fraught with big problems when not all the managers were in perfect agreement. In the best of times they fought it out and came to a consensus of direction above the level of the work being done, but the best of times usually never happened. There was posturing, disagreement and looming deadlines that became difficult for the people being managed. And business targets are never static - any agreement needed alteration almost as soon as it was made. As far as managing skill acquisition, consider a situation where the skills S1 that are required for one team are not the same as the skills S2 required by another team. Which skills must be acquired first? Generally, it’s possible that all, some or none of the skills may be common, or even that one set is completely contained within the other. The challenge is to try to keep the common required proficiencies for an individual maximized. The goal is for the multi-team member to need as few one-team-only skills as possible. This becomes more difficult as the number of skills and the number of teams a member belongs to increase. where each manager has a different appraisal of the required proficiency of the given skill to complete the work they are delivering. Except in the simplest arrangements, ρms is too complex to determine and agree upon for every required member and skill, so the managers must work together and do their best to estimate what skills at what time will be required by which members to deliver all of the assigned work on schedule. If the managers can not agree on the relative importance of the assigned tasks, on what to do next, they’ll be nothing but trouble. A smart manager will work to eliminate matrix management for as many of his team members as possible. It is too difficult to focus matrixed team members if they’re given conflicting directives, and the opportunity for this to occur under matrix management - even without interference from other managers - is relatively high. Until that happens though, the best solution is forcing consensus, which may involve backroom bargaining, extreme office politics, or (when no agreement can be reached) escalation to higher management. And so it is with the acquisition of skills. Maintaining proficiency in a skill requires practice - or else it will atrophy, as discussed in the second part of this series. Until the atrophy is considerable, reacquisition may not be difficult. However even then, if the skill set is large, it can be very difficult to keep from losing many skills while the focus of practice is on others. Each team member will naturally try to keep proficient in the skills they believe to be most important. But since everyone has their own idea of what’s going to be useful going forward, these may not always align with the actual needs of their team. For instance, consider a team that requires collective proficiency in 30 skills. Say each member were required to maintain a high level of proficiency in each skill that atrophied at 1% per week, and could acquire proficiency at 10% per week with an hour of reacquisition. On average three hours of skill reacquisition each week would be required by every team member just to maintain current levels. The acquisition of new skills would take even more time than maintaining existing ones. Starting from a lower level of proficiency, a member’s expertise will climb quickly at first, and then more asymptotically until the desired skill proficiency is acquired. A lot of their productivity will be spent on acquiring skills until the required skill levels are achieved. When many new skills are required, some members might feel like they’ve been thrown into the deep end of the pool to learn to swim, but are spending more time treading water than making forward progress. For a while, they may feel useless, making only a small impact on the team’s success. This can be a heavy burden for a team member’s confidence, a heavy hit to a team’s morale, and a heavy cost to productivity. It doesn’t take long for members to get tired of seeing themselves as less than proficient, even though they know there is no shortcut to acquiring and maintaining skills. The discipline required to keep important, but lesser-used skills from atrophy gets old quickly. A smart manager will recognize that it is more reasonable for each member to know a smaller set of core skills, and divide the extra-core skills across the team, reducing the reacquisition cost to perhaps only one hour per week, with much of that reinforced through practice. The manager should work closely with each of the team’s members to help them recognize the importance of staying proficient in key skills, making sure the team is always staffed with appropriately-skilled members. The final part of this series will discuss managing the skill acquisition of management. This is recursive self-skill-acquisition-management, and the focus will be on the thinking behind becoming the smart manager.